Look into Robert Leckie's classic, Brig Rat. I read it first in a magazine and later as a chapter in one of his books. Thanks. I'll put it in the queue. I am a big fan of Leckie. "The Old Man at the Bridge" is a very short story by Ernest Hemingway. It is based on an incident that Hemingway witnessed in the Spanish Civil War. Hemingway was covering the war as a journalist and was at the Republican last stand at the Ebro River in 1938. He originally intended to file it as a newspaper article, but changed his mind. An army scout is the narrator of the story. The story occurs on Easter Sunday which is meant to be ironic. He has returned from a reconnaissance mission to locate the Fascist forces. He crosses a pontoon bridge and encounters an old man sitting on the bank. Refugees are crossing the bridge, but the old man is not joining them. Curious, but mainly just killing time at first, the scout engages the old man in conversation as he listens "all the while for the first noises that would signal that ever mysterious event called contact". The old man is obviously disoriented by his experience. He apparently was a poor farmer or shepherd who took care of a cat, some goats, and some pigeons. Now they are gone and he is worried about them more than about himself. He seems accepting of death and has no desire to continue on. The story is full of symbolism. The cat with its nine lives symbolizes survival. The old man mentions that the cat will be fine on its own. The goats represent sacrifice. War requires sacrifices. The old man is a goat. As are all the refugees. The pigeons can fly away. Towards the end of the story, the scout refers to them as doves. This is a clear reference to peace. It has flown away. The bridge is the bridge between life and death. (Maybe that explains why the Republicans have not destroyed it as the superior Fascist army approaches.) In a sparse story, Hemingway has passed on his eye-witness experiences with war and peasants. The old man represents all the civilians. The war has turned his life upside down. He has not taken sides and probably has no idea of what the war is about. "'I was only taking care of animals.'" A variation of that line has been spoken since the dawn of warfare. "The Old Man at the Bridge" is typical Hemingway. It seems simple on the surface and at first you wonder what the big deal is. It is best suited for a high school English class. I have to admit I am not big on reading between the lines. You have to read between the lines to get the symbolism, but it is obvious Hemingway means more than a simple article about an incident in a civil war. I mean who shepherds a cat, some goats, and some pigeons? Last edited by warmoviebuff; 27 Dec 18, 13:46. 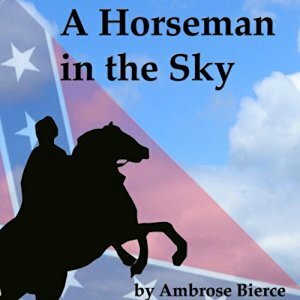 "A Horseman in the Sky" is one of Ambrose Bierce's most famous stories. It was published in 1889. Bierce used his Civil War experiences for the story. Bierce volunteered for the Union Army early in the Civil War. The story takes place near his home town where he was serving as a nineteen year old. He went on to fight in several battles, including Shiloh and Chickamauga. Bierce was hit in the head by a Minie ball at the Battle of Kennesaw Mountain. He became an author after the war. A sentry is on duty on a hill above a valley where his unit is encamped. It's a dangerous position because the camp is surrounded by hills. It is crucial that the sentries be on the lookout for an ambush. Unfortunately, this sentry is sound asleep. After reminding the reader that sleeping on guard duty is a capital offense, Bierce calls the young man a "criminal". One of the things that fascinates me about the military is the lack of sleep soldiers often have to deal with. To be threatened with death for something beyond your control is disturbing to me. I can see myself as that sentry. Anyway, he awakens for some unknown reason, which is something we can all relate to. Upon regaining consciousness, he perceives a horseman silhouetted against the sky on a nearby cliff. He describes the enemy scout as statuesque as he sits looking into the valley. The duty of the sentry is clear - he must stop that scout from reporting back the location of the Yankee force. Still, it is difficult to shoot another human being. The sentry hesitates and eventually decides to shoot the horse. At this point the story shifts perspective to a Union officer who is scouting in the valley. He witnesses the result of the sentry's shot. What he sees is so amazing that he decides his sanity will be questioned so he keeps quiet. The story ends by shifting back to the sentry who is interrogated by his sergeant about the gunshot he heard. I don't want to give away the ending. It is Biercian. The writing style is also recognizable. I did not know who the author was when I first read it, but when I found out it was Bierce it was no surprise. He tends to be verbose. In this case, he is very detailed in his description of the natural surroundings. It's a beautiful setting, but "no setting is so wild and difficult but men will make it a theatre of war". He paints a word picture of what the sentry is seeing. This was Bierce's forte as he was a topographical officer during the war. Bierce is also wonderful at little details in the sentry and scout. However, there is little character development in the story. Besides the descriptive scenery, the story features Bierce's use of flashback and foreshadowing. As the soldier sleeps, we learn that he had left his family to join the Union Army. His father takes this decision calmly, but calls his son a traitor to his state of Virginia. He tells his son they will discuss it after the war! His fatherly advice to his son is to do his duty. Duty over family turns out to be a major theme of the story. There is foreshadowing in this flashback scene. I am a Bierce fan. I earlier reviewed his super famous "An Encounter at Owl Creek Bridge". This story is not in league with that one. I found it to be the twist ending to be trite. He tends to be flowery. "By conscience and courage, by deeds of devotion and daring, he soon commended himself to his fellows and officers". He could have just said that his bravery earned him the respect of his comrades. But heck, he was writing in the 1880s, so what do you expect? The story is entertaining and the picture of a horseman sailing through the sky is alone worth the read. It is certainly a must-read for war short story fans. Last edited by warmoviebuff; 27 Dec 18, 13:48. "Beware of the Dog" is a Roald Dahl short story set in WWII. Dahl is famous as a children's author. He wrote many famous stories, including "Charlie and the Chocolate Factory". But before becoming an author, he was a fighter pilot in the RAF. He enlisted and became an ace while flying in the Mediterranean Theater in 1940. His first kill was a JU-88 over Greece. Earlier, he had crash-landed in the desert of North Africa and suffered serious injuries, including temporary blindness. He was later invalided back to England and his flying career was over. He was sent to Washington as an intelligence officer. In America, he married the actress Patricia Neal and they had five kids. The marriage lasted thirty years. A meeting with C.S. Forester inspired him to become a writer and his first work was about a wartime incident. One year later, in 1943, he published his first children's book, "The Gremlins". "Beware of the Dog" was published in Harper's Magazine in 1944 and later appeared in his "Over to You" collection. The story begins with a Spitfire pilot in distress over France. It turns out that he has lost a leg to anti-aircraft fire and is struggling to keep his plane in the air. He imagines how stoically he will deal with his mates when he lands, but he ends up having to bail out. Dahl does a great job describing falling through space before the parachute opens. Next thing he knows, he awakens in a hospital bed. A nurse is waiting on him and reassures him everything will be okay. But he is a bit suspicious about the situation. For instance, he could swear he heard some JU-88s passing over. The nurse assures him he must be mistaken. She mentions that he is to be visited by Wing Commander Roberts for a report on his downing. I won't give away the twist, but I will mention that the story was the inspiration for the WWII movie "36 Hours". 'Nuff said. The story is entertaining, although not outstanding. The mystery is intriguing, but it is easy to figure out with the clues given. In fact, the pilot figures out the subterfuge too easily. It does not have a shocking ending. For that reason, the pay-off does not deliver. The best thing about it is that it was expanded into an interesting movie.